Mediatek is announcing the MT 6381 Sensio 6-in-1 biosensor solution today. It may not break any technical ground but SemiAccurate thinks it is a very slick packaging of some useful sensors and analysis tools. 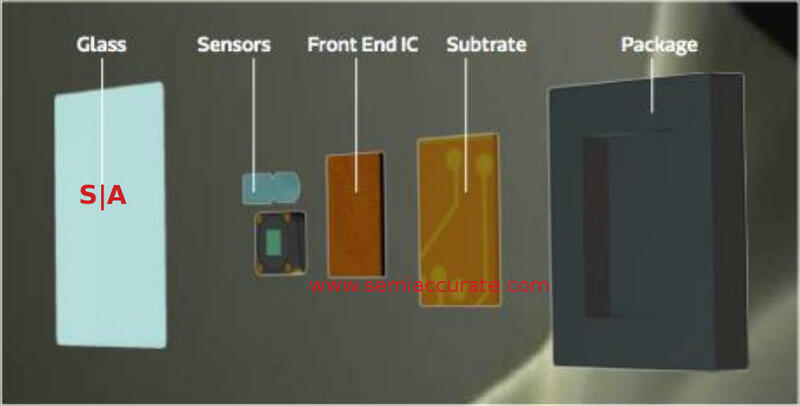 Sensio is the brand name, MT 6381 is the device that is more than a chip. The Sensio device comes with a package, substrate, front end IC, the sensors themselves, and a glass cover. This may seem like overkill but if you want it calibrated properly, you need the top layer/skin contact area to be invariable after manufacture. The 6.8 * 4.93 * 1.2mm package needs a 4 * 3mm hole and looks like this. What does Sensio measure? As the name MT 6381 implies it can read or calculate heart rate, heart rate variability, blood pressure, peripheral oxygen saturation (SpO2), ECG (Electrocardiography), and PPG (Photoplethysmography). You have to hold the device, phone realistically, bearing the Sensio in a specific way, one finger from each hand on a sensor to complete the electrical loop with the heart and one finger on the glass sensor on the back for LEDs to illuminate. Heart rate and variability along with ECG are obviously from the electrical sensors, PPG and SpO2 are LED based sensing technologies. The one we can’t pin down is blood pressure which tends to require cutting off of blood flow to measure accurately which Sensio doesn’t do. It also doesn’t require cannulation either so direct measurement is out. Mediatek didn’t get back to us in time to post how it works but our bet is on blood pressure being calculated from the data at hand, it can be done somewhat accurately with the a few of the other five data points Sensio gathers.